We perform a numerical simulation study of hollow-core anti-resonant reflection optical waveguides (ARROWs) fabricated using lithography and material deposition in the context of their suitability as a platform for on-chip photonic quantum information processing. We explore the effects of the core size, the number of pairs of anti-resonant layers surrounding the hollow core, and the refractive index contrast between the anti-resonant layer materials on propagation losses in the waveguide. Additionally, we investigate the feasibility of integrating these waveguides with Bragg gratings and dielectric metasurfaces to form on-chip cavities that could act as nonlinear optical elements controllable with single photons when loaded with atomic ensembles. D. E. Chang, V. Vuletić, and M. D. Lukin, “Quantum nonlinear optics — photon by photon,” Nat. Photonics 8, 685–694 (2014). M. Bajcsy, S. Hofferberth, V. Balic, T. Peyronel, M. Hafezi, A. S. Zibrov, V. Vuletic, and M. D. Lukin, “Efficient all-optical switching using slow light within a hollow fiber,” Phys. Rev. Lett. 102, 203902 (2009). V. Venkataraman, K. Saha, and A. L. Gaeta, “Phase modulation at the few-photon level for weak-nonlinearity-based quantum computing,” Nat. 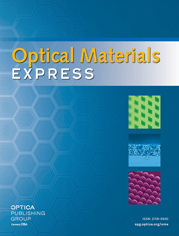 Photonics 7, 138–141 (2013). B. Wu, J. F. Hulbert, E. J. Lunt, K. Hurd, A. R. Hawkins, and H. Schmidt, “Slow light on a chip via atomic quantum state control,” Nat. Photonics 4, 776–779 (2010). H. Schmidt and A. R. Hawkins, “The photonic integration of non-solid media using optofluidics,” Nat. Photonics 5, 598 (2011). C. M. Haapamaki, J. Flannery, G. Bappi, R. A. Maruf, S. V. Bhaskara, O. Alshehri, T. Yoon, and M. Bajcsy, “Mesoscale cavities in hollow-core waveguides for quantum optics with atomic ensembles,” Nanophotonics 5, 392 (2016). P. Roberts, F. Couny, H. Sabert, B. Mangan, D. Williams, L. Farr, M. Mason, A. Tomlinson, T. Birks, J. Knight, and P. S. J. Russell, “Ultimate low loss of hollow-core photonic crystal fibres,” Opt. Express 13, 236–244 (2005). K. Nagayama, M. Kakui, M. Matsui, T. Saitoh, and Y. Chigusa, “Ultra-low-loss (0.1484 dB/km) pure silica core fibre and extension of transmission distance,” Electron. Lett. 38, 1168–1169 (2002). M. A. Duguay, Y. Kokubun, T. L. Koch, and L. Pfeiffer, “Antiresonant reflecting optical waveguides in SiO2 − Si multilayer structures,” Appl. Phys. Lett. 49, 13–15 (1986). T. Delonge and H. Fouckhardt, “7th international symposium on high performance capillary electrophoresis integrated optical detection cell based on bragg reflecting waveguides,” J. Chromatogr. A 716, 135–139 (1995). W. Huang, R. M. Shubair, A. Nathan, and Y. L. Chow, “The modal characteristics of arrow structures,” J. Lightw. Tech. 10, 1015 (1992). B. S. Phillips, “Tailoring the spectral transmission of optofluidic waveguides,” Ph.D. thesis, Brigham Young University (2011). E. J. Lunt, “Low-loss hollow waveguide platforms for optical sensing and manipulation,” Ph.D. thesis, Brigham Young University (2010). D. Yin, J. P. Barber, A. R. Hawkins, and H. Schmidt, “Waveguide loss optimization in hollow-core arrow waveguides,” Opt. Express 13, 9331–9336 (2005). D. Yin, H. Schmidt, J. Barber, and A. Hawkins, “Integrated ARROW waveguides with hollow cores,” Opt. Express 12, 2710–2715 (2004). Y. Zhao, M. Jenkins, P. Measor, K. Leake, S. Liu, H. Schmidt, and A. R. Hawkins, “Hollow waveguides with low intrinsic photoluminescence fabricated with Ta2O5 and SiO2 films,” Appl. Phys. Lett. 98, 091104 (2011). E. J. Lunt, B. Wu, J. M. Keeley, P. Measor, H. Schmidt, and A. R. Hawkins, “Hollow ARROW waveguides on self-aligned pedestals for improved geometry and transmission,” IEEE Photon. Technol. Lett. 22, 1147–1149 (2010). R. Bernini, S. Campopiano, L. Zeni, and P. M. Sarro, “ARROW optical waveguides based sensors,” Sensors and Actuators B: Chemical 100, 143–146 (2004). New materials and Technologies in Sensor Applications, Proceedings of the European Materials Research Society 2003 - Symposium N.
A. Othonos, “Fiber Bragg gratings,” Rev. Sci. Instrum. 68, 4309–4341 (1997). E. Hecht, Optics (Addison-Wesley, 1998), 4th ed. H. Baghdasaryan, T. Knyazyan, T. Baghdasaryan, B. Witzigmann, and F. Roemer, “Absorption loss influence on optical characteristics of multilayer distributed bragg reflector: wavelength-scale analysis by the method of single expression,” Opto-Electronics Review 18, 438–445 (2010). J. Flannery, G. Bappi, V. Bhaskara, O. Alshehri, and M. Bajcsy, “Implementing Bragg mirrors in a hollow-core photonic-crystal fiber,” (under review) (2016). H. Tanji-Suzuki, I. D. Leroux, M. Schleier-Smith, M. Cetina, A. Grier, J. Simon, and V. Vuletić, “Interaction between Atomic Ensembles and Optical Resonators. Classical Description,” Adv. At. Mol. Opt. Phy. 60, 201–237 (2011). J. D. Joannopoulos, S. G. Johnson, J. N. Winn, and R. D. Meade, “Photonic crystals: Molding the flow of light,” Princeton University Press (2008). A. Arbabi, Y. Horie, M. Bagheri, and A. Faraon, “Dielectric metasurfaces for complete control of phase and polarization with subwavelength spatial resolution and high transmission,” Nat. Nanotechnol. 10, 937–943 (2015). V. Lousse, W. Suh, O. Kilic, S. Kim, O. Solgaard, and S. Fan, “Angular and polarization properties of a photonic crystal slab mirror,” Opt. Express 12, 1575–1582 (2004). H. Tanji-Suzuki, W. Chen, R. Landig, J. Simon, and V. Vuletić, “Vacuum-induced transparency,” Science 333, 1266 (2011). J. G. Bohnet, Z. Chen, J. M. Weiner, D. Meiser, M. J. Holland, and J. K. Thompson, “A steady-state superradiant laser with less than one intracavity photon,” Nature 484, 79 (2012). Fig. 1 Schematic drawing of the cross sections of an ARROW: (a) lengthwise; transverse cross section of (b) a conventional hollow-core self-aligned pedestal ARROW that has a high index layer beneath the core (n1 > n2) and (c) a hollow-core self-aligned pedestal ARROW that has a low index layer beneath the core; (d) conceptual vision of an integrated opto-electronic system combining an ARROW loaded with atomic or molecular vapor with a Bragg grating and micro-wires that could be used to, e.g., generate magnetic field. Fig. 2 Numerical simulation (a) of the transverse profile of the fundamental waveguide mode and (b) of the propagation loss spectrum of a hollow-core ARROW with a 5.8µm × 12µm core surrounded by 3 pairs of Si3N4(1.74)/SiO2 cladding layers arranged as shown in Fig. 1(b), designed and optimized for a wavelength of 852 nm. (c) Numerical simulation of propagation losses in waveguides optimized for 852 nm light with assorted hollow core sizes and three pairs of of Si3N4(1.74)/SiO2 cladding layers as shown in Fig. 1(b). (d) Effects of the number of cladding layer pairs and of the refractive index contrast between the two materials forming each pair on the simulated propagation losses for waveguides with 5.8µm × 12µm hollow cores. The square data points correspond to the cladding layers arranged as shown in Fig. 1(b), while the triangular data points represent cladding layers arranged as shown in Fig. 1(c). The value in brackets denotes the refractive index of the cladding layer material. Fig. 3 (a) Etched gratings in the various anti-resonant layers: first layer above the core (left), first layer beneath the core (middle), and the top layer (right). (b) Change in the effective index of propagation Δneff for a hollow-core ARROW with 5.8µm × 12µm core surrounded by three pairs of Si3N4(1.74)/SiO2 cladding layers. The x-axis refers to the etch depth δt relative to the original thickness t of that particular layer. When etching the very top layer, at etch depths shown to induce uncharacteristically large effective propagation index contrasts and losses, the mode is no longer quasi-Gaussian within the core. (c) Estimated best mirror reflectivities of the Bragg gratings formed by etching the three different cladding layers obtained using MSE with plane wave incidence. The dash-dot horizontal lines mark the maximum reflectivity for grating in a particular layer. (d) Estimated reflectivity spectrum of a 10000 period Bragg mirror created by periodically etching the anti-resonant layer beneath the core. The etch depth is 70% of this layer, which creates an effective propagation index contrast of 5 × 10−4 with a 8% increase in loss. Fig. 4 (a) Schematic showing how the dielectric metasurface mirror would be integrated with the hollow-core ARROW waveguide. (b) Cooperativity of hollow-core ARROW (Amode = 18µm2) cavity formed with two dielectric metasurface mirrors for various waveguide lengths and mirror reflectivities. (8) g = μ ℏ ℏ ω 2 ϵ M V m o d e .